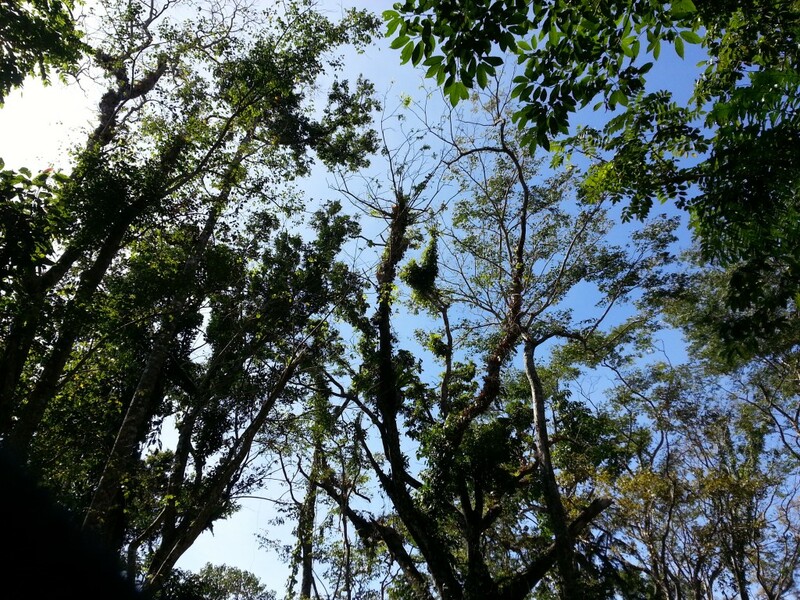 In Mount Makiling, scientists recorded an estimated 120 avian species (birds), with 59 endemics belonging to 26 families. Moreover, at least 50 species of mammals, 120 bird species, six amphibian species, 19 reptile and a number of fish species were also recorded, according to Journal of Nature Studies. There are at least 416 species of ferns and flowering plants and 118 species of arthropods. 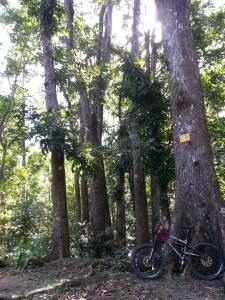 The mountain is rich in biodiversity due to the preservation of the forest area inside the University of the Philippines Los Banos College of Forestry. UPLB, the largest University in the Philippines (with 15000 hectares), occupies part of the mysterious and mystical Mount Makiling. 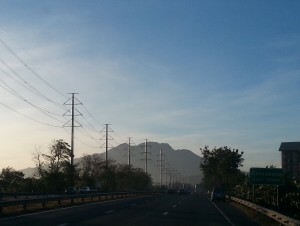 From Manila, we took the South Luzon Expressway and traveled south towards Los Banos, Laguna. We finished the SLEX and exited in Calamba, taking the shortcuts inside and finally landing somewhere near Letran de Calamba. We passed by Pansol where families swim in resorts that boasts of naturally hot spring water. They say that if you put a raw egg in the pools of Pansol, it would get cooked. These hot spring resorts are all products of the majestic mountain called Makiling. We took a right at the Philippine Council for Agriculture, Aquatic, and Natural Resources Research and Development PCAARRD to enter the UPLB campus. We passed by the former Magnetic hill and entered the UPLB campus via the Boyscout’s entrance gate. Since we were riding the Defender of the Universe, the climbs were easily conquered. But seeing the slope and angle of ascent of the road, this is not an easy climb for bikers. You would need the granny of your granny to climb the switchbacks and hairpins of PCAARRD. 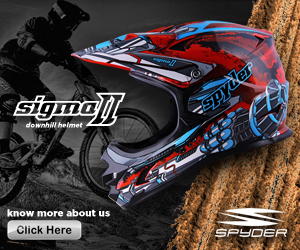 A normal vehicle would need the first gear and still be straining to climb these twisty roads, much more bikers?! We reached UPLB and breathed in the University town fresh air. Quiet faculty homes and dormitories greeted us as we met our trail master, Jonathan. He has a freshman daughter studying in UPLB and is an alumnus himself. We parked at the UP College of Economics and Management and prepared our bikes for the adventure. We strolled around campus first and passed by the field, the dorms, the infamous Fertility Tree, and started our ascent towards the College of Forestry. It was a steady climb, not too steep, yet challenging for the inexperienced climbers. 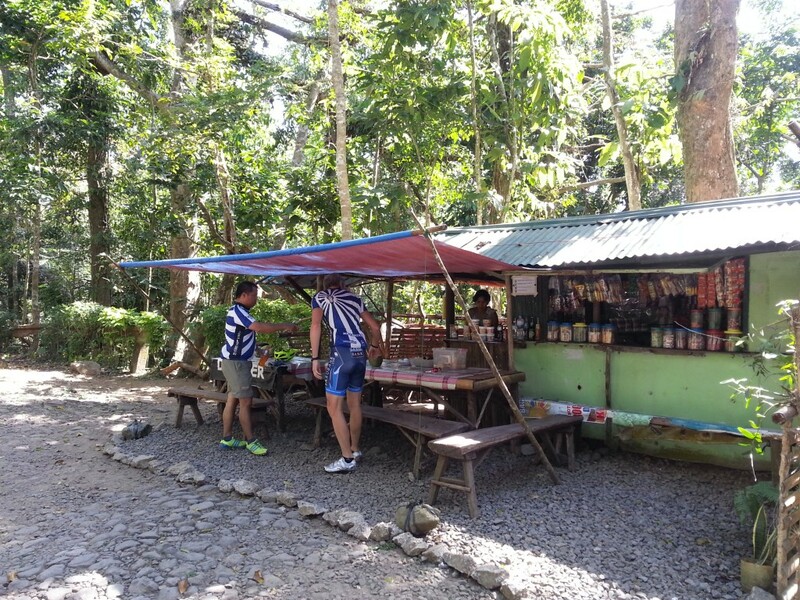 We paid ten pesos to enter the Mount Makiling Forest reserve. It is great to know that there are areas like this that they preserve for the coming generations. 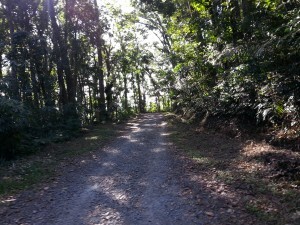 The fire road is paved until a certain point and then it becomes a gravel one vehicle wide back road leading towards the top. We stopped by for fresh buko at station seven and chatted with some of the locals. 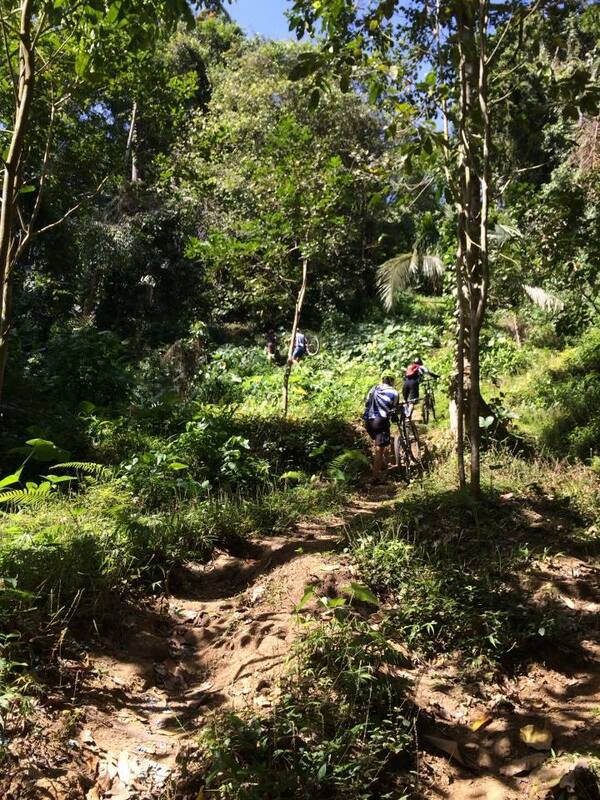 The only way up is also the way down for bikers so we asked around for some hidden trails or footpaths off the road. They told us of one path leading towards the school in Bagong Silang. Local say that the trail is impassable for mountain bikers but they knew a biker who crossed this trail, Russell. 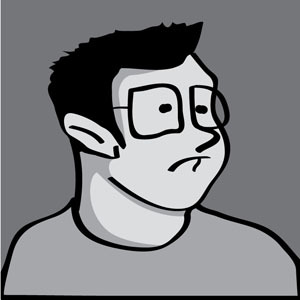 Incidentally, Jonathan and Ohmar knew Russell well and since he has done it, it is do-able. The mountain goats looked at each other and we all agreed to do it, that’s what we’re here for! We took on the challenge and braved the foot path, looking for the school in Bagong Silang. We traversed two big hills and crossed a small stream where ladies were washing their laundry. We said our pleasantries and greetings to the local folks, and rode along. There were a lot of unride-able parts due to the giant rocks and the gradient was too steep. We hiked and carried our bikes in most parts but that’s what we signed up for, being all first timers in this trail. We still had fun despite all the obstacles. We finally reached the school we were looking for and we rested in the small community by the Geothermal machinery. It was a long downhill ride from the barrio and we had to crouch low due to the strong head wind. We had fun overtaking each other and fooling around. We picked up speed and got down really fast. We pedaled our way back to the UPLB campus via Ipil road. Ergo, the Mt. 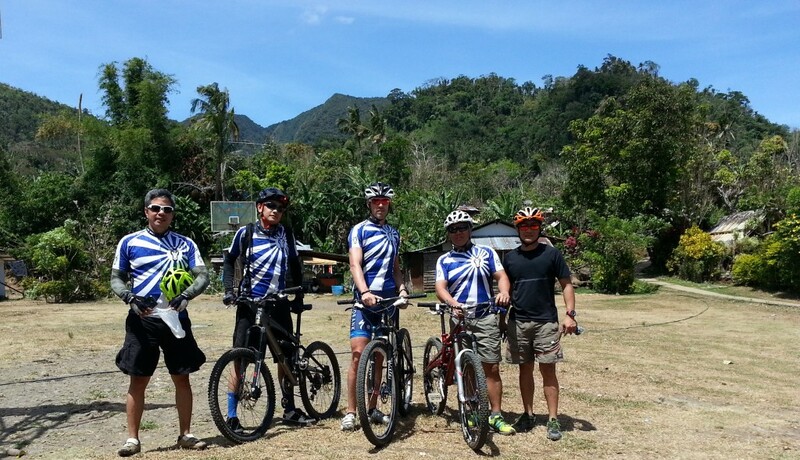 Makiling ride was a fruitful adventure. We got to ride on a different mountain, plus we got to see some fine scenery. The Mountain Goats got talking that we wished that someday, some local riders could convince the local authorities that mountain biking is very sustainable and helpful for the surroundings. 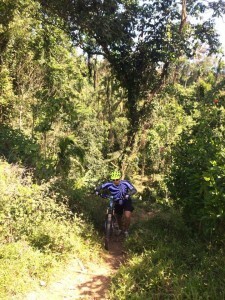 They could manicure the trails and make it into a bike park so that we can have a lot of options to ride to; making the Philippines one of the more challenging mountain bike countries in the world. We can do it. All we got to do is GET TOGETHER.